Ready to Say “Bon Voyage” to Bermuda? Some folks like bermudagrass lawns because the grass is very drought tolerant and it creates a thick turf. On the other hand, many homeowners don’t like bermuda because it is brown for seven months out of the year (mid October to mid May) and it is very invasive in gardens and landscape beds. If you fall into the second category, consider changing your lawn from bermuda to fescue this year. There is a relatively small “window of opportunity” each year to kill bermuda (a warm-season grass) and replace it with fescue (a cool-season lawn) and that “window” is late July through September. Attempts at any other time of year will not be successful. The key is to kill bermuda in the summer when it is actively growing and then be ready to seed with fescue in the fall while the soil temperature is still warm but the air is cool. Renovation from bermuda to fescue takes a little work (and patience) but it’s well worth the effort. Fescue rewards you with a green lawn for at least ten months out of the year and won’t creep into your landscaped areas. Bermudagrass spreads by deep underground roots (rhizomes) and above-ground runners (stolens) so it’s important to get a complete kill—roots and all—or the bermuda will be back next summer. Just follow these simple steps to eliminate your bermudagrass lawn and remember that timing is very important. You may be able to alter from these recommendations by a few weeks—but not a few months. • Start in July with fertilizer and water. Ironic as it may seem, healthy bermuda is easier to kill. You want to begin this project with strong, actively growing bermuda. • Spray the bermuda with Hi-Yield Killzall or Roundup in late July to August. Add Hi-Yield Spreader Sticker to the mixture to increase absorption ... and Mark It Blue, a horticultural dye that allows you to see exactly where you have already sprayed. • Do not water your lawn for 48 hours after spraying. Wait to spray if rain is in the immediate forecast. • After a few days, water the treated lawn. The objective is to stimulate any live grass to green up so that you can spray it again and mow off dead grass. • 7-14 days after the first spray, assess the kill and spray areas that are still green or gray-green. • In 7-14 days, spray again if necessary. This may seem like “over” kill but it’s well worth your time. If bermuda roots are not dead they will come up in your fescue lawn next summer and it is very difficult to remove bermuda from fescue lawns. This third spraying may or may not be necessary depending on weather conditions, spray coverage and a number of other conditions. • After the lawn is completely dead, mow it short to remove most of the brown grass and stems. Remaining roots and stems may be left in the ground and will act as a mulch to hold the seed and soil in place. • DO NOT rototill your lawn at this time. Tilling is rarely necessary unless you plan to incorporate amendments into the soil. Most amendments do not require tilling so consult with the professionals at Johnson’s first. • By now it should be early to mid September—the perfect time to plant fescue grass seed. Follow the steps found in our handout “Overseeding Your Cool-Season Lawn” for complete how-to information. There is no one grass that is best for all situations. 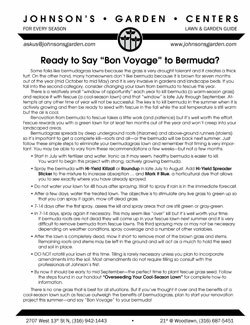 But if you’ve thought it over and the benefits of a cool- season lawn such as fescue outweigh the benefits of bermudagrass, plan to start your renovation project this summer—and say “Bon Voyage” to your bermuda!